Are you bold? Are you brave? Are you willing to just blindly toss money at a board game without knowing the slightest thing about it? Then toss away! 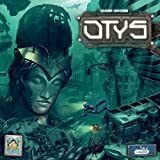 Buy your own copy of OTYS from Amazon, and we’ll salvage a small commission.